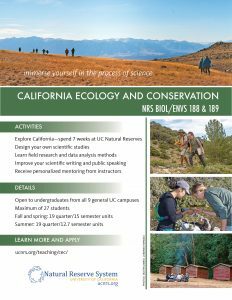 The following flyers and posters are available to help publicize the California Ecology and Conservation course. Each PDF is formatted for printing. I feel very comfortable coming up with a scientific question and actually producing an experiment, purely because of this course. I’ve already learned so much more in two weeks than I have in a whole semester of any other class.